BAR32/EC190 has an outdated design and one of the lowest price. 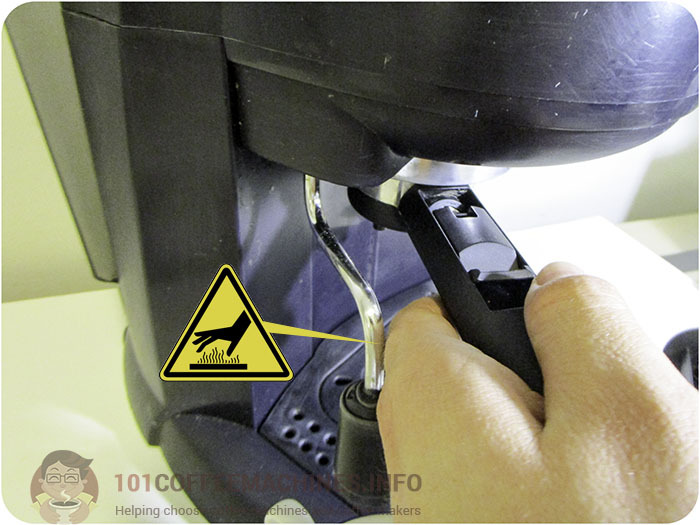 However, 99% of espresso-related parts are the same as used in modern models by Delonghi. One model in Delonghi’s range of manual espresso machines has the record high number of ‘clones’ – different names, under which this machine is sold on different markets. 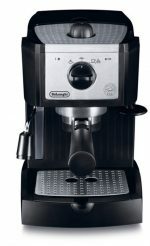 It is known as Delonghi BAR32 Retro or EC220CD in the States and in Canada. In the rest of the world, it is marketed as Delonghi EC190, EC191, EC201, EC220 (also called Delonghi Motivo) or EC221. I list only currently available models, Delonghi used to produce even more ‘clones’. Highly likely that this very model would be the cheapest on your local Amazon (check it) among Delonghi’s makers. If not overall. The color of the rotary knob (gray plastic/black plastic/chrome coating). The color of the body is always black, despite that sometimes it looks dark blue on photos. The auto shut-off function to qualify for European Energy ‘Class A’ Label. This is true at least for the EC201CD (maybe some other models as well). Everything else is being equal in all of the above-mentioned models. Moreover, under the hood, it has very little differences with any of modern espresso machine by Delonghi of ECP, ECO, ECZ and ECI series. Delonghi BAR32 Retro Espresso and Cappuccino Maker still uses a 180ml stainless-steel boiler (biggest in the class of budget espresso makers). It’s big enough to make two espressos or one lungo, but don’t try to make long coffee on it – it’s better either to dilute espresso with hot water to make Americano or choose thermoblock model (Dedica or La Specialista), which can deliver a larger amount of hot water at once. It has a 15-bar pump by ULKA in order to be called a real espresso machine (cheaper ‘espresso machines’ without pump simply can’t generate enough pressure to make real espresso). As any other espresso machine under $1000 (not only Delonghi) Delonghi EC190/191/201/220/221 vibrates and is quite loud (because the pump is of vibrating type). It makes the same or almost the same espresso with the same taste. 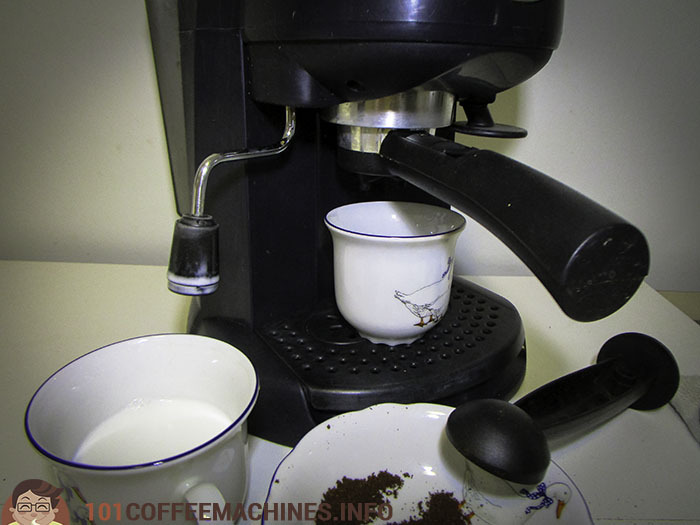 Technologies and parts used aren’t changed, so you will get no taste difference if you are drinking espresso. There could be a very small difference in the temperature (to be explained below). What’s the difference then? Except for the design. A different steam wand, which is used for milk frothing. It is really much less efficient than modern ones. It’s hard to make a decent micro dispresed milk foam for your cappuccino on this machine. Be ready to practice a lot or get just a milk with big bubbles instead of foam. It is also not much space under the wand, most of the milk pitchers won’t fit there. 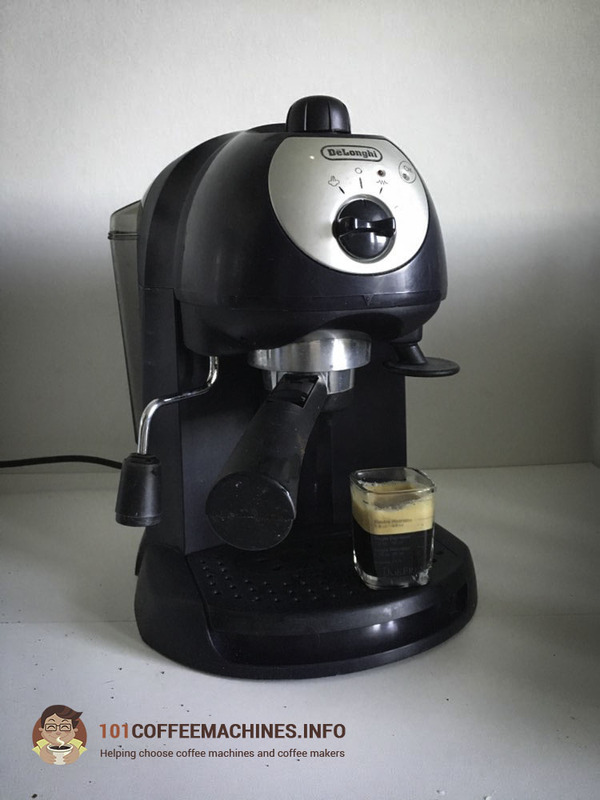 By the way, two above-mentioned cons are also inherent to Delonghi EC155 and EC156, which I will compare with the BAR32/EC190 further in my review. It doesn’t have a cup stand/cup warmer. Usually, on top of any modern espresso machine, you can find a plate for cups that could also be used for making cup warmer (boiler is located underneath and give some heat to this cup stand). Here, on Delonghi BAR32 (as well as on EC190, EC201, etc …) you will not find it. Being an old model BAR32 still uses filter baskets of ‘old’ type. However, they are still installed on EC155/156 and ECO310 machines. I described the differences between them in this review of Delonghi ECO310. Just to mention – old filter gives better crema than new ones, however, it has some plastic parts inside and you should detach and clean it every month or two. The taste is the same. The simple and reliable control panel with on rotary knob in the center is rather a strong point. Some of the modern machines have too many buttons in my opinion. Built-in tamper is rather useless. You better buy a normal one down the road. Both 51m and 52mm diameter tampers will fit, this one on Amazon, for example, is OK. Or this one on Aliexpress. EC155, ECO310 and ECO311 still have the same drawback, by the way. Finally, because of the old filter’s construction and because of the plastic body, which is less efficient in keeping the warm inside the machine, an espresso shot made on the BAR32 Retro could be a bit colder than on modern machines. Though, it’s no more than 1-2 degrees distinction. Delonghi EC155 and EC156 (I reviewed them here) are also a very old model but with more ‘evergreen’ design. In the comparison with the Bar32 Retro, which looks like it came straight from the 90s, the EC155 still looks good. This is probably the reason why it is more popular. The only difference between them is design. However, it gives one functional benefit – the EC155M/156 has cup stand on top. From a technical point of view, both models are identical. If you are not embarrassed with an outdated design and you drink only black coffee, then the BAR32 Retro, EC220CD or any of corresponding European models (EC190/201/220/221 etc) could be a good chance to buy a real Italian-engineered espresso machine for the lowest price possible. No espresso-related parts and technologies have been changed since this machine was presented. 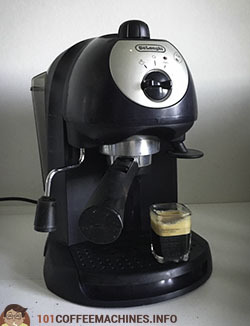 Most of modern Delonghi espresso machines use the same proven technologies. This is why the old BAR32 makes espresso just as well as modern Delonghi models do. Keep in mind though some usability issues. But the taste of espresso and big stainless-steel boiler are strong pros. It’s definitely better than numerous Chinese-engineered machines by Carpesso, Mr. Coffee and more unknown brands (their name is Legion). If you consider buying a machine for milk drinks like cappuccino or latte then this model is barely suitable. You can get used to its steam wand and get milk foam of an average quality, of course. However, I would highly recommend raising your budget to afford at least Delonghi ECP 31.21 (ECP3120 or ECP3220 in the States). Another option to consider is Saeco Poemia, especially if you are from Europe, where it has a reasonable price tag. It is also a classic boiler model with even better espresso (for my taste). I have a review of this machine here. Poemia’s panarello isn’t perfect, however, it is much better if compared to the BAR32/EC190-221.